Great debut album, not a track on here i disliked, standout tracks for me are Old Flame, Call Me & Good Intent. 4.5 for now, pretty cool stuff and Kimbra can proudly hold the title of the 'only New Zealand artist worth caring about' while it lasts. Old Flame and Settle Down are pretty cool faveourites. 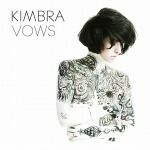 Although like the majority of people, I first heard of Kimbra through Somebody That I Used to Know and not triple j, she has become one of my favorite artists not due to Gotye (although Somebody that I Used To Know is exceptional), but through an awesome solo album. <br>Vows is a great album, my favourites are Two Way Street, Call Me, Good Intent and Settle Down.